The epitome of casual cool, this collection of men's Blackstone slip-ons is set to become a firm favourite. A brand credited as being integral to the nineties grunge movement, Blackstone is renowned for doing footwear in an utterly unique way. Distressed, crackled or well-grained leathers appear throughout, lending a worn-in quality to designs that are defiantly luxurious. 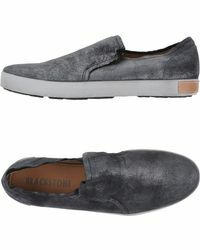 Contrast this with modern shaping and construction, and it's clear why men's Blackstone slip-ons are primed to stand out. Expect all manner of wing-tips, pared-back slip-ons and relaxed loafers confidently delivered by the line.